There are now more than 120,000 hotel rooms to choose from in Orlando, with the biggest choice of accommodation to be found along International Drive and the US 192 highway. Lodging opportunities also present themselves around Orlando International Airport (MCO), where hotels are usually very competitively priced. Due to the city's plentiful family orientated theme parks and choice of affordable hotels, cheap Orlando holidays are often in great demand, particularly package deals offering the best value in conveniently locations. If you are planning to stay onsite at the famous Walt Disney World, booking ahead is essential, since occupancy levels in this part of the city are always extremely high, and understandably so. Disney hotels are known to drop their prices slightly between September and November, and again in January, when visitor numbers are at their lowest. Well-known hotel chains are in plentiful supply close to Orlando Airport, with both the Fairfield Inn and Hyatt Regency hotels lying alongside the actual airport. Many further hotels can be reached in just a matter of minutes and offer courtesy shuttle buses, which can be requested using allocated telephones at the airport. 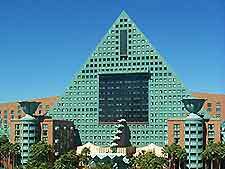 Below is a list of the main hotels in close proximity to Orlando Airport. Those wishing to stay away from the airport will not be disappointed by the selection of hotels on offer, with many hotels connected by a range of ground transport. The most popular hotels in and around Orlando can be found in the following areas. A vast area which almost resembles a small town, Orlando's Walt Disney World has everything you could possibly desire on a vacation, with an enormous selection of hotels, top restaurants and shopping centers. Other highlights in this district include golf courses, night clubs, theme parks with roller coasters, and an endless variety of tourist attractions, with many well-placed hotels often located nearby. The downtown district of Orlando contains a number of attractive tree-lined streets and appealing neighborhoods, with many reasonably priced hotels available. Downtown Orlando covers a vast area and is home to a collection of entertainment venues and places to visit, being split into a collection of notable neighborhoods, which include the Central Business District, Eola, Parramore and Uptown. The perfect place to explore the city, International Drive is central to life in Orlando and has much to offer. Although the city's main theme parks are located away from this area, accommodation along International Drive is never far from attractions and restaurants. Many hotels along International Drive are high-rise buildings and offer impressive views of the city and the surrounding area. The town of Kissimmee is a short distance from both Orlando city center and the Orlando International Airport (MCO). Known for its inexpensive accommodation, both motels and hotels in Kissimmee tend to offer better value for money, with Disney World and other attractions being just a short drive from Kissimmee.